This page contains a single entry by Ginger published on February 25, 2019 10:37 AM. Wordpress 5.0, Gutenberg and Your Website was the previous entry in this blog. Churches exist in many forms, from small groups meeting in homes, to thousands of worshippers gathering in large sanctuaries each week. All churches are unique, and need to express a unique identity to visitors and members online. That's why no church should settle for a cookie-cutter website. 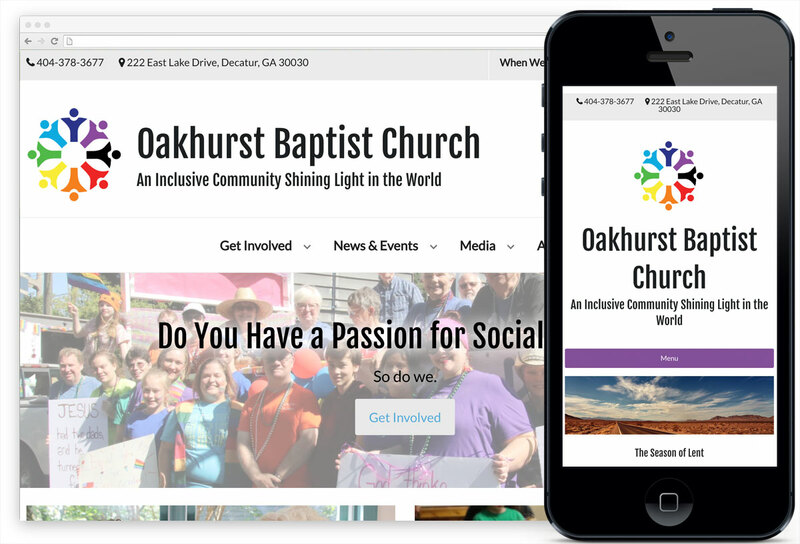 Oakhurst Baptist Church in Decatur, Georgia recently partnered with Heideldesign to develop a new church website. Church leadership had two objectives: to streamline the content, and to modernize the design. The new design places a high emphasis on photography, with eye-catching photos floating on a clean, white background. The photos provide Oakhurst an opportunity to connect visually with site visitors, presenting the people and places that make up the church. First time visitors can get all the information they need on one easy-to-find page. Simply click the "I'm New" button to learn more about the church - everything from the church's main mission and ministries, to the practicalities like where to park and what to expect during worship. The site features a Sermons page, with each Sunday's sermon embedded and streaming from YouTube. An on-site calendar of events helps members and visitors stay aware of opportunities to connect. And a password-protected members-only page is available for sharing church documents with the congregation. The new site was unveiled to the church Sunday, and Pastor Lauren Colwell says the response was enthusiastic. "We have gotten a lot of positive feedback about the website," she says. "Everyone is saying how clean and fresh it looks, but also how well it tells our story." If your church needs a new website to tell its unique story, we'd love to work with you. Let's talk.